Hello Ladies! Summer is started. Especially those who love to wear sarees that has cool styled and most elegant during summer that must have chiffon sarees in wardrobe. Chiffon saree is the most popular fabric that made of tightly twisted yarns consist of high-quality threads. Chiffon is a very lightweight and perfect fabric for summer. Especially sarees are look in chiffon fabric is most elegant and give the beautiful look to a lady. Saree is the attire of women, maybe it is not worn on a regular basis but she surely wears on occasion or function. During summers when you went to a party than chiffon saree is the best outfit for a lady. All of us remember “Yeh Jawaani Hai Deewani “Movie Deepika Padukone wear chiffon saree in a function that looks awesome and gorgeous she quite left impression with style. Using chiffon saree you can turn your style statement from wow! Do you want to carry elegant style or left some impression on function? Do you want to look gorgeous? Do you want to wear like Deepika Padukone style? If yes, then we described here some chiffon saree with different blouse. Saree with designer poncho blouse is being in trend. 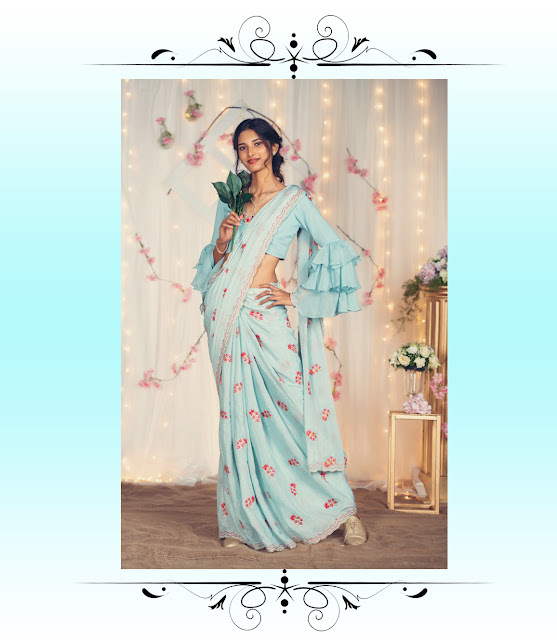 This eye-catching drape looks like Pataka of the wedding function. This poncho style is a great way to add new stylish look into your outfits and its look more gorgeous. Ruffle sleeves is a hot trend it’s not just for celebrities but also for a dashing lady that always turn out to be the talk of every occasion. This sleeve is not unique but also give your figure with modest touch. How to wear a saree without showing stomach? then go for peplum blouse. Chiffon ruffle saree with this peplum blouse is now trending in these days. Try this peplum blouse with your saree that turn into a western look. 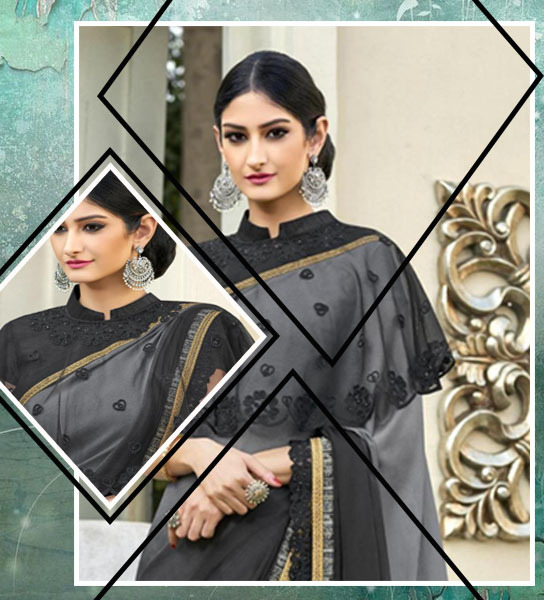 Women love to wear saree on different function or occasion, this Jacqueline Fernandez family saree with black sequence blouse its perfect to a blend of smooth and elegant. 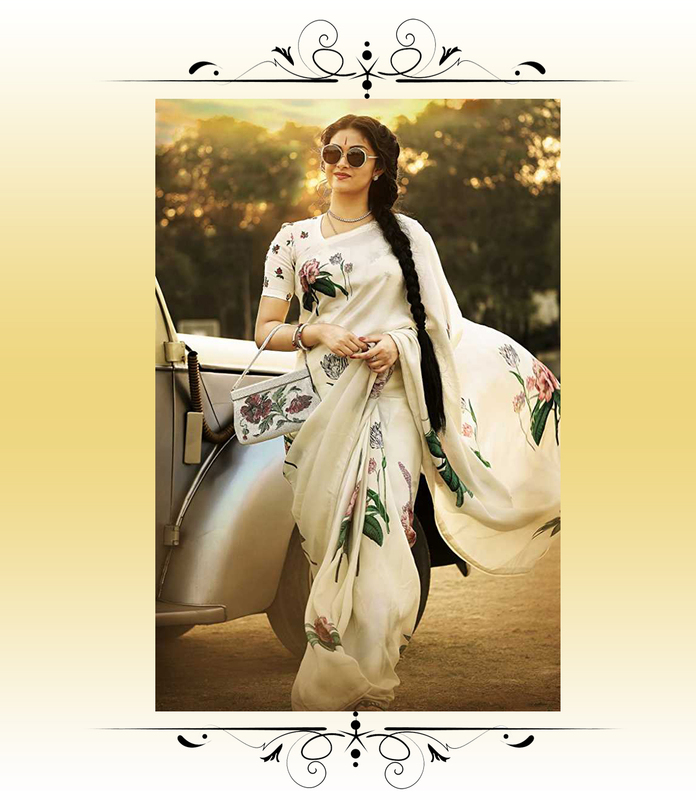 This white flower design saree with flower print blouse this saree looks amazing in your body this type of fabric is falling lovely. Today floral design is making beautiful your attire. You can visit our Indian Ethnic Wear Website to get the latest and trendy collection. Follow fashion trend - 2019, shop now and get a benefit of the exciting deal with worldwide Free Shipping.